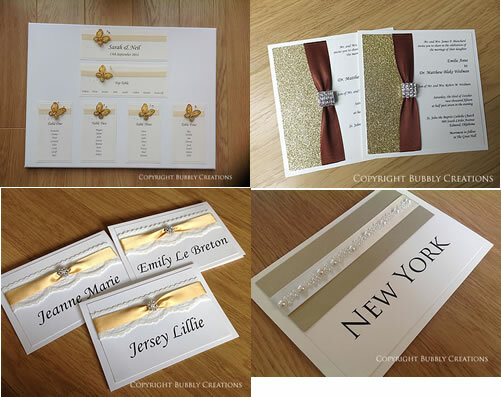 Another collection using the glitter card is our ‘Glitter’ collection. 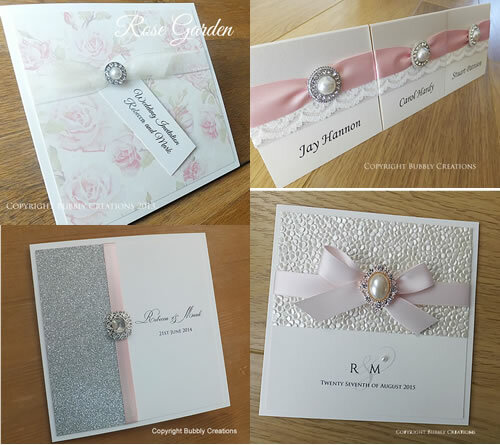 The wedding invitation is made with the glitter on the left hand side of the card and finished with satin ribbon and a crystal embellishment. The glitter is non-shed and is available in many different colours including champagne, dusky pink, emerald, purple, red and blue. 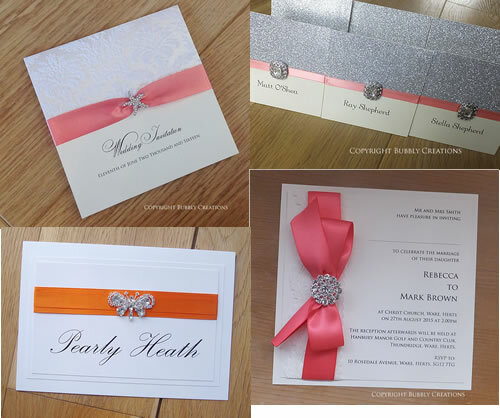 It is a luxurious invite and is made on thick 300gsm card. 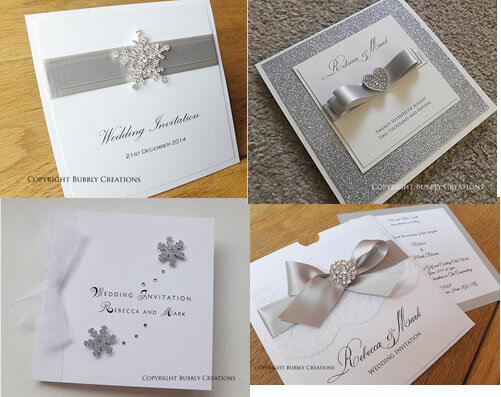 It can be made as a pocket, wallet, folded or flat invitation and you can change the glitter and ribbon colours to match your colour scheme. 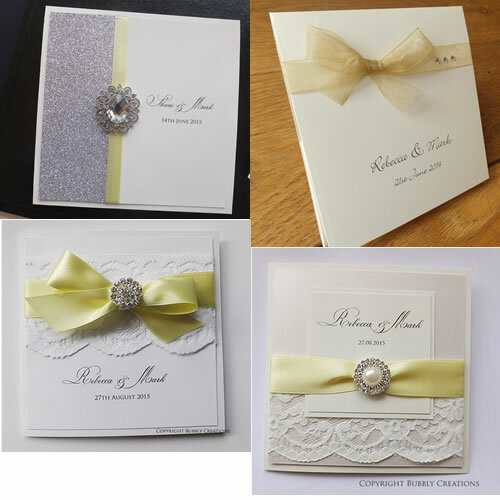 Shani placed an order for her wedding last year in our Glitter stationery and went for ivory card, silver glitter and lemon ribbon. 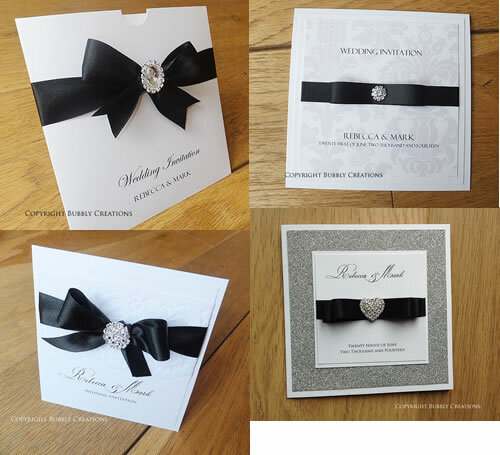 She chose to have pocket wedding invitations and also ordered some matching menu’s and table number cards for her reception tables. We booked Shani a second date in our diary, a few weeks before the wedding to make her Menu’s and table number cards. Matching Table Number Cards. 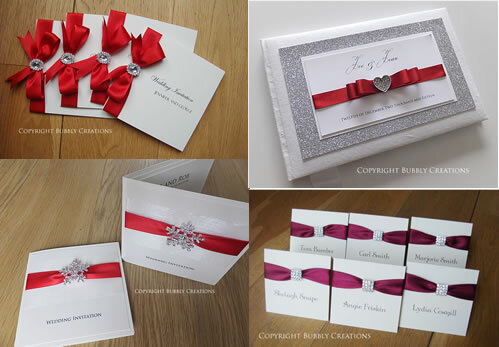 They are made on a folded card so can be free standing or placed in a holder. 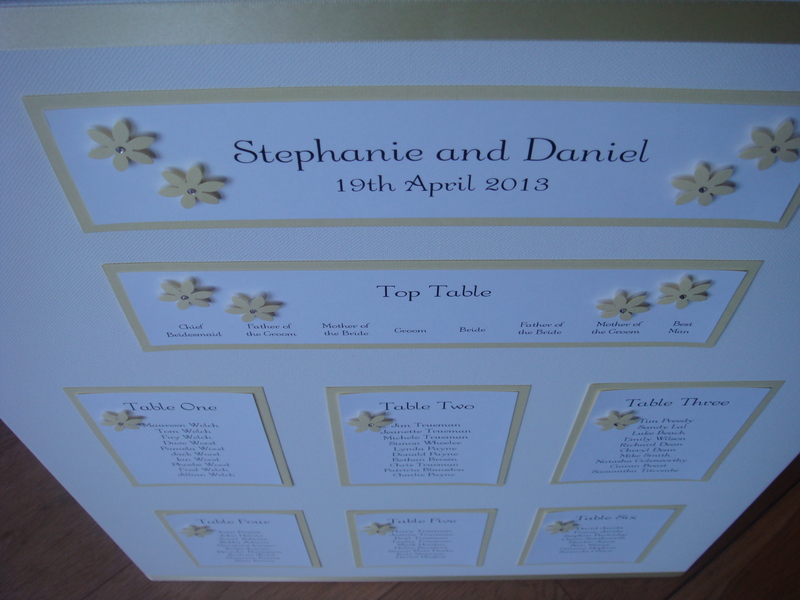 This featured order is our Delicious Flower design which is one of our more simple designs and budget friendly. The customer ordered this classic invitation with matching stationery in Lemon for her wedding later this month and is perfect for the spring (if the sun ever does come out). 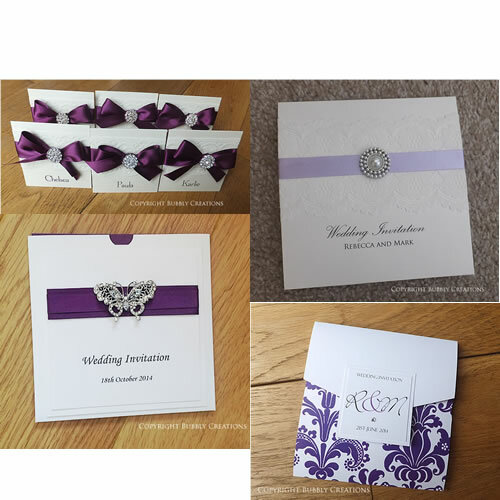 The wedding invitations come with matching coloured card and two raised flowers with a swarovski crystal in the centre and the on the day stationery like the table plan, place cards and table number cards are designed to match these perfectly. 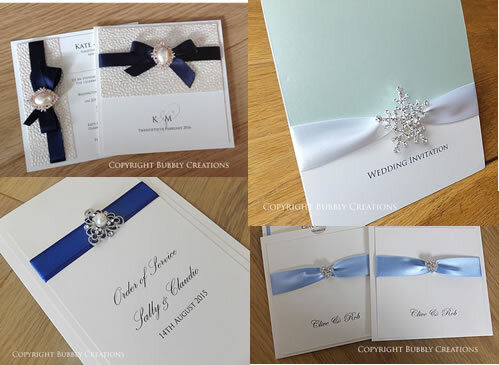 We have a large choice of coloured card that can be used on this design so we can make these in your colour scheme, you can also have different coloured flowers to the backing card if you would prefer. 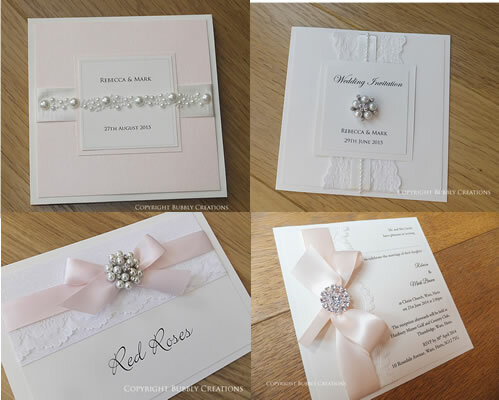 The Delicious Flower wedding invitation is available as a pocket, wallet, folded or flat style with many customers choosing different styles of invite, one for the day and one for the evening. It is also available with Snowflakes, Hearts and Butterflies. 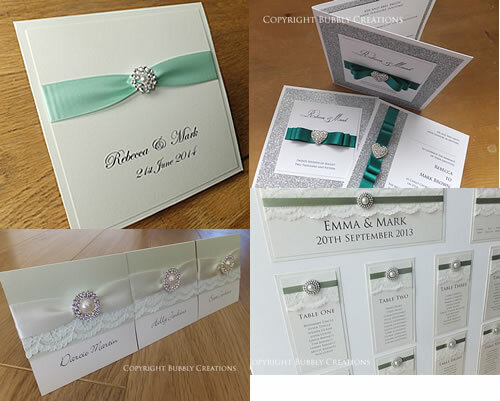 Every design is available in a large collection of wedding stationery including Orders of Service, Menu’s, Thank You Cards and Guest Books.